In the early 90’s we listened to Bertha Reppert, founder of The Rosemary House talking about some simple home remedies, and within a few days, several of the actors at the Renaissance Festival where we had an herb shop showed up covered with poison ivy. Bertha had talked about steeping sage in apple cider vinegar, and we’d gone home and started a batch. It was very effective for the poor sweaty, suffering actors, and we were impressed. This couldn’t be simpler, and is just wonderful as is. Just fill a jar with sage from the garden (or grocery store) and cover with vinegar. If you’re in a hurry, heat the vinegar and steep the sage in it as you would an herbal tea. The following year we added plantain and jewelweed to the original brew, to add even more healing properties to the vinegar. We’ve used it ever since. I just made a quart up today. The ingredients are shown below. If you don’t have or know how to identify jewelweed, her cousin – garden impatiens is a good stand-in. We like to harvest jewelweed in the spring while the stems are succulent and full of juice. After it flowers, the stems get woody and aren’t worth much. Some people like to harvest the leaves and flowers after it blooms, but this is how we do it. The sage we grow here is Bergarten, which has a very high essential oil content. That’s really what we want to come through in the vinegar, so any garden sage is fine, but we like this one. In a pinch, you can even use the dried stuff in the spice aisle at the grocery store, but fresh will have more punch. Even city dwellers most likely have plantain in their midst. Plantain is exceptional for skin irritations, bug bites and stings, and all kinds of rashes. We have both types here, the long strappy lanceolata, and the large major, and use them interchangeably. All of the plants are chopped up and placed into the jar. Cutting them up (or even placing them into a blender with a little vinegar to get it going) helps release their properties into the vinegar. After all the plant matter is chopped and placed into the jar, it is covered with vinegar. I reserved some large plantain leaves and some jewelweed stems. The plant matter is carefully covered with the leaves, and then the stems are inserted in such a way as to hold everything below the surface. Be careful not to enclose air pockets under the leaves, though. All ready to sit and age for a couple of weeks. It is perfectly fine to leave everything as it is until needed. Then, just strain it out and apply to any area that has been exposed to poison ivy (preferably before a rash appears!). It stings slightly when applied, but will really help dry up a rash in a hurry. The other best remedy is to learn how to identify poison ivy and avoid it. and also have the vinegar spray on our website, but we’re very happy to encourage you to make it yourself. Who is The Essential Herbal? 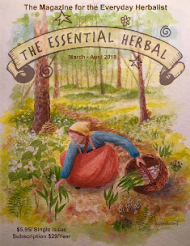 If you’ve been reading this blog, you might be a subscriber to The Essential Herbal Magazine (thank you), but there’s a good chance that you aren’t aware that there is a magazine attached to the blog. Over the past year or so, I’ve been inundated with offers to write for “your website” or requests for me to highlight products on “your website”. There is a website, but this is not it. Here on the blog we publish past articles and highlight our advertisers on occasion. That’s the whole point, isn’t it? So then, perhaps it might be a good idea to re-introduce ourselves to our blog readers. It’s been over 7 years for the blog and 10 for the magazine, after all. 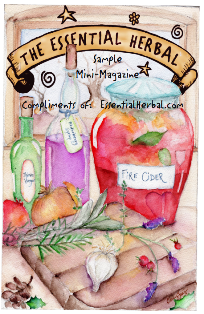 The Essential Herbal Magazine started out as a 16 page newsletter full of all kinds of ways to use and get to know herbs. We now stick to 32 pages, and they contain so much usable information for the typical individual wishing to learn about herbs, that it seems like much more. It is written by herbalists, herb enthusiasts, and those who are deeply in love with the world of plants. We all share our knowledge, experience, recipes, ideas, and sometimes our mistakes. The pages of the magazine are often described as feeling like a long letter from old friends, talking about the things we all enjoy. It’s an honest-to-goodness print magazine that mails out 6 times a year. At the start of 2012, we began to offer a PDF version to our customers who requested that option (and that is the only version available outside the US now), but that is exactly the same as the print version. No gimmicks, come-ons, or secret content, just the magazine. The entire staff is comprised of 1.5 people, so our main goal is to continue doing what we do as well as possible. From all over the country (and sometimes the world), we receive articles that are filled with the joy of discovery. Along the way, our readers learn to identify plants that they can use for first-aid, disease prevention, and self-limiting illness. 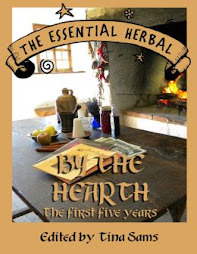 They learn to make all kinds of herbal preparations like tinctures, balms and salves, blended herbal teas, soaps, bath crafts, and scrumptious herbal dishes, We’ve published books in segments, carried a full series of herbs of the zodiac, and are currently covering a historic woman herbalist in each issue. We have subscribers who have been with us the entire 10+ years of publication, and some writers who never fail to come up with something fascinating for each issue. We never know how an issue will shake out until the deadline arrives. It is thrilling work, and our readers tell us it is just as much fun for them. I’m pretty sure you’d enjoy it. Me? I’m Tina Sams, the founder, editor, and head nag (just ask our writers). After 10 years of co-owning an herb shop and retail/wholesale handmade soap company, my sister and I got tired. We sold the shop, she continued the wholesale soap business, and I thought it would be fun to start an herbal newsletter. After years behind the sales counter at the shop, I wanted to answer all the questions that people asked everyday. It felt like people were far too intimidated and distanced from the plants growing around them, and it would become my new vocation to attempt to lift that veil and share the intense satisfaction that one gets from knowing how to work with herbs. There is rarely an issue without a typo or two. The inside pages are all black and white. No frills, just great articles that will encourage you to try something you’ve never tried in each issue. If you enjoy the blog, I bet you’d love the magazine. On our website, we have the covers and tables of contents posted for the last few year. There are also a lot of other interesting herbal books and products. Check us out! This year the chive blossoms have been unusually spectacular. The single little pot that was planted 1/2 a decade ago has now scattered seeds, expanding to an area of several feet in diameter, popping up between mint plants (who can take care of themselves, thankyouverymuch). Each spring, the greens show up before most anything else is awake, and soon the flowers are waving from the tips, sparkling with a color that is unlike that of most spring flowers. All of the alliums are good for us. Garlic gets all the press, but they all have the same health benefits to varying degrees. The long spring this year must have had some effect on the color of the blooms. They are almost magenta, rather than the usual soft pink (top picture is from last year). This called for some chive vinegar. To make any herb or flower vinegar, all that is required is some good quality vinegar suited to the intended infusion, a jar, and the herb. 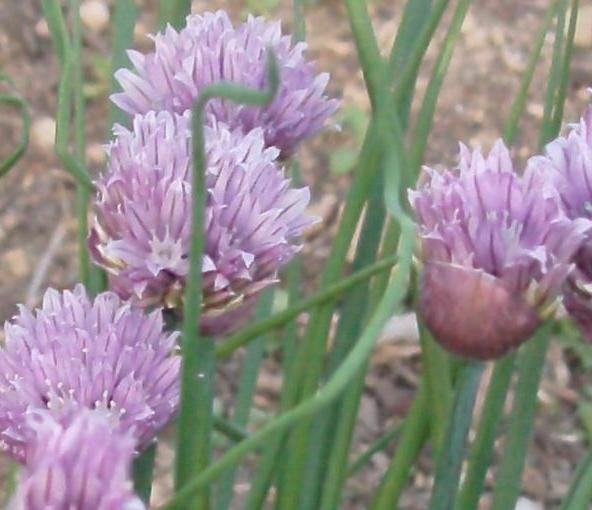 For chive blossoms, we want to see the color and taste the fresh garlicky flavor, so we choose a white wine or rice vinegar. For this batch, it was white wine vinegar. Fill the jar with chive blossoms. Just pop them off the stems, rinse to remove any inhabitants, and dry them on a tea towel for a few minutes, and then put them in the jar. Cover them with the vinegar. My own tip (which I use with vinegars and tincture making) is to break up wooden skewers to the correct size, and then make an "x" across the top, just before the jar narrows. That keeps the plant matter submerged, which is necessary to avoid spoilage. 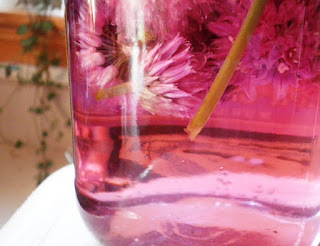 Within a few days, the color transfers from the flowers to the vinegar. For flavor, you'll want to taste the vinegar after about a week, and then decide whether to let it continue steeping or not. This vinegar was the right flavor for me in about 10 days. Some vinegars you can just allow to sit until you're ready to use them - entirely up to you! After it was strained, I picked a few fresh blossoms and put them into the bottles I'd be using. The color will stay on the fresh blossoms, since the vinegar is saturated with color now. The finished vinegar must be stored out of sunlight to retain the jewel toned brilliant pink color. Visions of luscious salads dressed with this vinegar and a little oil dance in my head. This has been a long, long spring, and we've had lots more time to play in the gentle sun than we usually get in a typical spring. This morning I was thinking about how the 15th was the safe date to plant out things that can't handle frost, but we haven't had a hard frost here on the hill since mid-February. The constant winds up here helped with that on the rare nights when frost threatened, but mostly we've had a surreal winter and spring. At the same time, as I was thinking about what odds and ends need to be done before the Jul/Aug issue of The Essential Herbal Magazine can be put together for print, I was feeling a little sorry for myself. A couple of weeks ago I had some needed surgery, and was fretting about missing out on spring. Then I gave myself a little kick in the pants! 4 months of spectacular spring, and I'm whining about missing a few weeks. The best way to get over any residual self-pity is to count blessings. It may sound trite, but it really is a valuable life skill. So I started thinking about all the fun things we made during classes in the early spring, some of the talks we gave that turned into catalysts for projects at home, the swap I jumped into at the last second, the test batches of elderberry candy for an article I'm submitting to another publication, the sheets upstairs that are already covered with anise hyssop and violets to dry, and the syrups and vinegars I got to make already. I got to distill some white sage, play around with bear grease and cottonwood buds, and make a wild mushroom tincture. Watching the plants burst from the earth, send out leaves, blossom and begin to fruit has been a rare joy. Seriously, a typical spring filled with faires, classes, and talks to groups never gives me the kind of time to play that landed in my lap this year. This has been a spring filled with all sorts of fascinating herb work. Big deal, the weeds get another week to grow before I'm allowed to do battle with them. I'll be too busy on the magazine anyhow. Counting blessings put me back on track today. And that's another blessing. This poppy languished in the shade for three years before I moved it last year, and it is rewarding me for the effort by blooming repeatedly with lush, gorgeous blooms. Maybe next year it will spread! When I moved to this house 6 years ago, there was already lots of good stuff growing all around me. Plenty of lovely wild herbs, trees, and some beautiful plants that my mother and sister had put in close to the house. Gradually I've added much more than I realized. Rows of lavender and sage, mint patches, chamomile, and trees are now part of the landscape, and I take them for granted. Some of the things that have gone in struggled for years because they needed more light or less groundhogs. It's been rainy, and I've been on an enforced vacation for a while, so today I got out for a few minutes to see what is going on. What a marvelous surprise! Everything has returned. Nothing was lost - not even the passionflower that I was sure had gone forever! The horseradish is tall among the weeds, the witch hazel is bushing out, and the persimmon is about to bloom. The sour cherry is covered with lush leaves. It is very rewarding to see all of the plants that I've tucked in and nurtured have survived and thrived - as well as the volunteer (and most desired) mimosa tree. Lots of fruits and herbs in the near future. Bluets were purchased as a tiny, almost invisible bunch of upright threads atop a few miniature leaves. They are simply a sentimental flower for me, reminding me of a miraculous morning. Finally the blueberry patch is filled with many, many bunches of unripe berries. Half a dozen plants went in the first year, and they've been whittled down each spring by varmints. This year with the help of a fence, we'll have fresh blueberries to harvest. I've never bothered to grow my own comfrey before, but last year my sister and I dried our own for soapmaking, and found it to be so superior that we will always grow and dry it ourselves from now on. The flowers are exquisite. The red currants have been carefree from the first year, and have produced since the second. They are one of those plants that keep you going, keep you trying new things. Elder blow is already covering the "auria" bush in the corner. Always early, but never in the first week of May before. The bush is now 8 feet across and at least as tall. Standing next to it, the scent is intoxicating. My friend Roe sent me some elecampane roots last year, and I was afraid to look, since their location is especially weed-ridden and rocky. Both of the plantings took root, and they look pretty happy! I expect that there will be ripe figs to eat by mid-June. Another gift from a friend, this has been another one of the plants that gave me courage to try others. It has been happy here from the day it was planted. Gooseberries. We lost some to frost, as last week when I tweeked the branches, tiny yellowed fruit fell to the ground, but it looks like there will still be plenty to eat. Each year we participate in a conference and receive small packages of iris bulbs. Last fall I finally planted several years worth - and today they peeped out above the weeds to thank me. Last year the birds got all the serviceberries, and shortly thereafter, tent caterpillars took over the small tree. I was worried about how it would survive the winter, but it looks just fine. Maybe I'll even get to eat some this year! Herbal Window Shopping, or We LOVE our Advertisers! Here at The Essential Herbal Magazine, we just couldn't make it without the support of our advertisers. We'd like to take a moment out and thank them - and let you know a little bit about them. We always have their links along the side of the blog, but a little spotlight never hurt anyone :-). Click on the links and visit them today! 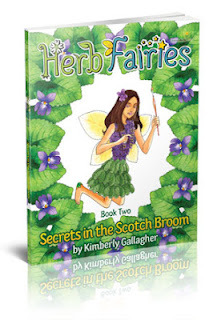 We want to list this one first because it is time sensitive - The Herb Fairies series is only available until May 5 from Learning Herbs, so you'll want to click on this one right away. Additionally, they are holding a FREE herb seminar with Aviva Romm on herbs for summer on May 3 - so we wanted to let you know about that, too. Possum Creek Herb Farm is the place I got my elderberries! Great plants, great service, and Michele and Pat provide both retail and wholesale herb plants. Visit today and see if they have what you've been looking for. Alloway Creek Garden near Gettysburg PA is on the farm of Barb and Roger Steele. 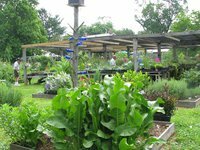 Each year they have a garden and art faire, featuring artists, herbs, music and food. A great time is had by all! This year it is June1 and 2 - 10 to 3, rain or shine. Blessed Maine Herbs is the home of renowned herbalist and writer Gail Faith Edwards, and is where her beautiful herbs are grown with the help of her children and extended family. 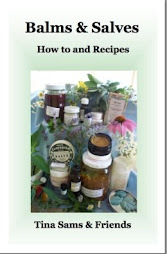 Visit her website for class information, herbs, books and much more! BJ's Lavender is located in Bakersfield, Ca. 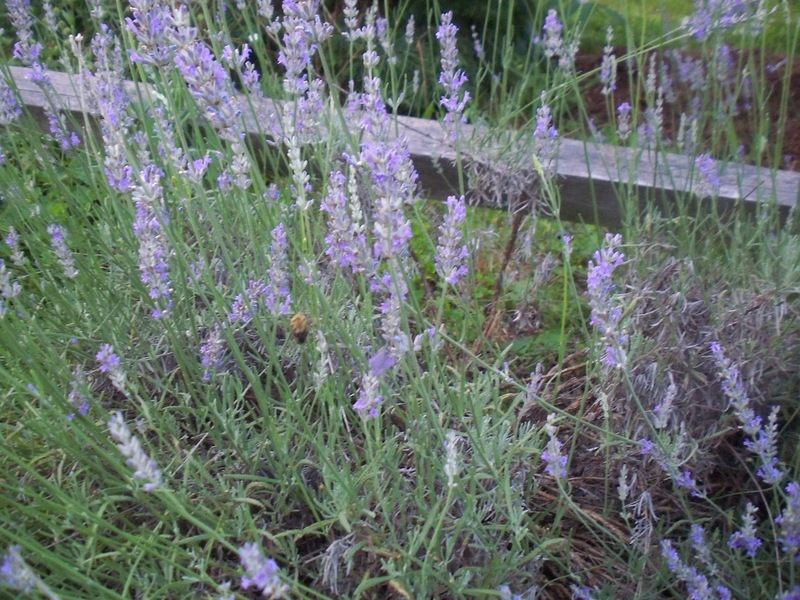 They grow lavender for crafts & three kinds for culinary. Their culinary lavender is mild in taste & a little sweet. They have been growing lavender for 3 years and have now opened the farm to the public. 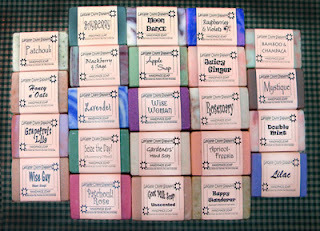 Lancaster County Soapworks, Etc., has been making soap for wholesale customers for over 15 years. 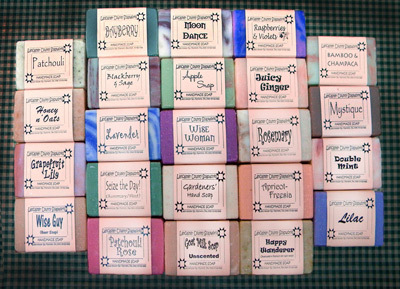 If you have a shop and want to add a beautiful line of hand-crafted soap, check it out. 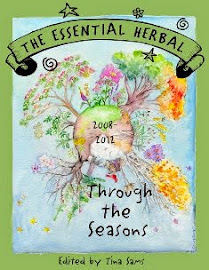 Alicia Grosso is well known to many soapmakers from her books and delicious writings in The Essential Herbal Magazine. Her website is filled with luscious stuff! This premier event in the Midwest promises to be memorable and the start of something big. Many of my herbie friends living within a state or two are very much looking forward to this conference in June. It looks great! 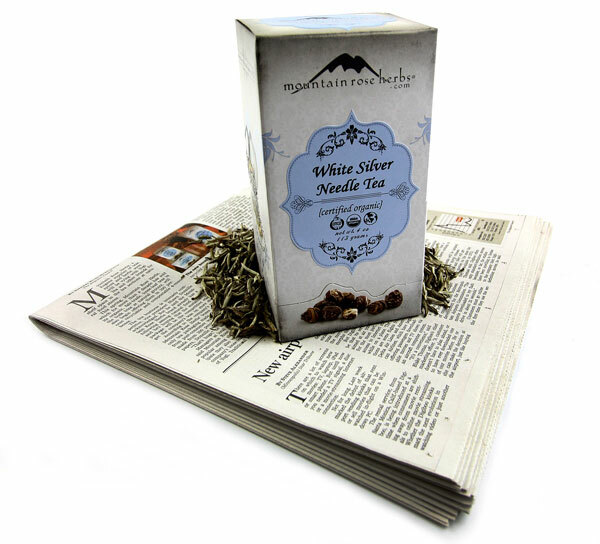 Speaking of premier, Mountain Rose Herbs is the first place we look for herbs we can't grow ourselves. Their ever-expanding line of herbs and herbal products and supplies make a visit to their site worthwhile any day. 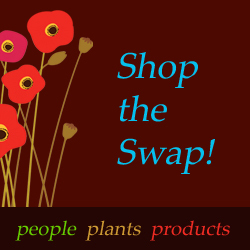 Poppy Swap is a great place to shop for herbal products made by individuals and small companies that you often can't find elsewhere. A magical herbal "mall" filled with surprises. Herbalist Susan Hess is the owner of Farm at Coventry - a place of herbal learning, delightful herbal preparations, and a certain peaceful sensibility that harkens to days gone by. You'll love Farm at Coventry! A lot of people think that Herbal Roots Zine is for kids, but I think it has a lot to offer to all beginning herbies! 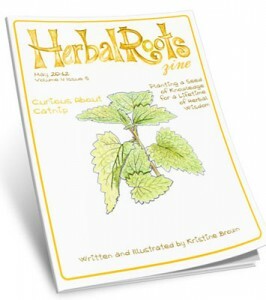 Creator Kristine Brown puts together this monthly pdf zine with obvious love and knowledge, focusing on a single herb each month. Herbs from the Labyrinth, and the physical shop in Lancaster PA - Radiance - are filled with a myriad of hand crafted herbal treasure that are either made by herbalist Sarah Campbell, or sourced from free-trade countries and responsible crafters. Great site, and if you're ever in the area you need NEED to stop in! 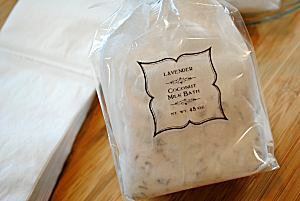 Handcrafted soap and lotion makers (as well as other bath and body products) will love The Original Soap Dish. 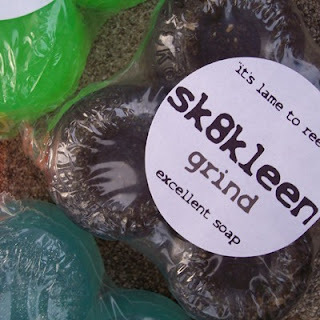 All kinds of ingredients, fragrances, packaging, and equipment for home crafters or businesses. She even has some bio-degradable packaging options! Sun Rose Aromatics is an oasis filled with beautiful, rare, exquisite essential oils, as well as diffusers, salt lamps, resins, incredible incenses, gift sets, teas and tea accessories, and much, much more. Torchsong Studio is the showcase of our lay-out director. 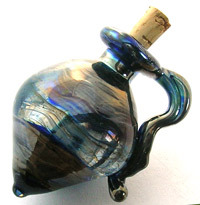 Maryanne makes spectacular beads and vessels from rods of colored glass. I keep her too busy to put a lot on her site, but what she manages to get up there is spectacular. When you're ready to take that next step in the soap business, SoapEquipment.com is the place to go. Everything from molds to melters, to whippers, to packaging solutions - you'll find what you need here.